GAGGIA (Gaggia Espresso; Gaggia Espresso Machine) – See Coffee Companies. GAMINESS – An off-taste created by careless processing of natural coffee’s. Similar terms are earthiness and wildness. GCE (Green Coffee Extract) – This extract is produced as part of the Process method of decaffeinating coffee. Green coffee extract is created by soaking green coffee beans (milled but not yet roasted) in hot water and then allowing them to release their caffeine and coffee solids into the water. The coffee beans are then discarded and the liquid is passed through a carbon filter which traps the caffeine while allowing coffee solids to pass through. The resulting extract is known as green coffee extract (GCE), and it is comprised of decaffeinated coffee solids. The extract is then used to decaffeinate a new batch of green coffee beans as caffeine diffuses from these new green coffee beans due to the composition of the green coffee extract. The GCE is then put through a proprietary carbon filter to remove the caffeine. The process is repeated until the coffee beans are comprised of only .1% caffeine (one-tenth of one percent), and thus the coffee beans are 99.9% caffeine free. At this point the coffee beans are dried out and most of their flavor qualities are left intact. GEISHA (Gesha) – See Panama Geisha Coffee. GELATO – See Espresso Cuisine. GHB (GOOD HARD BEANS) – A grade of coffee beans in the altitude-based coffee grading system of Costa Rica. Good Hard Beans are grown at elevations ranging from 3,300 feet to 3,900 feet. Also see Medium Hard Beans; Strictly Hard Beans; Soft Beans; Costa Rica Coffee. GHIMBI COFFEE – See Ethiopian Ghimbi Coffee. GOLD BLEND – A Nestle company freeze-dried coffee product sold in the United Kingdom under the Nescafe umbrella brand. GOOD CUP QUALITY – Denotes a coffee whose overall characteristics (e.g., body, acidity, aroma) are good and positive. GOOD HARD BEANS (GHB) – A grade of coffee beans in the altitude-based coffee grading system of Costa Rica. Good Hard Beans are grown at elevations ranging from 3,300 to 3,900 feet. Also see Strictly Hard Beans; Medium Hard Beans; Soft Beans. Also see Costa Rica Coffee. GOURMET BREWING – Brewing coffee at a low level of extraction which removes approximately 16.5% of soluble materials from the freshly-roasted, ground coffee beans. GOURMET COFFEE – The terms gourmet coffee, premium coffee, premium gourmet coffee, and specialty coffee are all used to refer to the highest quality coffee beans. Gourmet coffee beans are cultivated and processed with care to ensure that the coffee beans develop properly and their unique and distinctive tastes and fine aromatic qualities are preserved. Some of the world’s most respected gourmet coffees include Arabian Mocha Mattari, Tanzania Peaberry, Kenya AA, Hawaii Kona, Java Arabica, Sumatra Lintong, Ethiopian Harrars and Yirgacheffes, Jamaica Blue Mountain, and Sulawesi Toraja Coffee. GOURMET COFFEE LOVERS – See Coffee Websites. GRADE/GRADING COFFEE BEANS – See Grading Coffee Beans. GRADY – This term is used mostly in the United States and refers to a coffee flavor characteristic/taste sensation of dirtiness, yet not to the extent that the coffee would be described as dirty. GRANITA ESPRESSO – See Espresso Drink Recipes. GRANITA LATTE – See Espresso Drink Recipes. 1) The most commonly used industry technique of grinding roasted coffee so it is ready for brewing. Granulation involves passing the coffee through a series of rollers. 2) The process of converting freeze-dried coffee into small particles that appear similar to ground whole bean coffee. Also see Instant Coffee. GRASSY – An herbaceous flavor and/or aroma/odor descriptor suggesting freshly mown lawn, alfalfa, the astringency of fresh green grass or herbs, raw fresh vegetable leaf, green foliage, dried herbs or grass, dried green beans, or unripe fruit. The grassy taste quality exhibits a distinct herbal character which is due to a prominence of nitrogen compounds in the coffee beans as they mature in the coffee cherry (fruit). This grassy taste characteristic is often detected in unripe coffee beans as well as some batches of freshly-harvested coffee (e.g., early new crop coffees), particularly at the beginning of the coffee harvesting season, and often attributed to insufficient roasting time and roasting heat, which doesn’t allow the sugar carbon compounds in the coffee beans to develop. Also called Herbal; Green. GREEK COFFEE – This coffee beverage and coffee brewing method involves grinding coffee beans to a powder and then adding sweetener and spice before boiling it in water in an ibrik, which is a copper or brass pot with a long handle. The very fine coffee grinds are served with the drink that is traditionally poured into a demitasse where the grinds are left to settle a bit before drinking. Greek Coffee is also called Turkish Coffee, Middle Eastern Coffee. GREEN – An herbaceous flavor and/or aroma/odor descriptor suggesting alfalfa or freshly-mown lawn with the astringency of fresh green grass or herbs, green foliage, raw fresh vegetable leaf, dried herbs or grass, dried green beans or even unripe fruit Often a distinct herbal character is present due to a prominence of nitrogen compounds in the coffee beans as they mature in the coffee fruit (cherry). This green taste sensation is often detected in unripe coffee beans as well as some batches of freshly-harvested coffee (e.g., early new crop coffees), usually at the beginning of the coffee harvesting season, and often attributed to insufficient roasting time and heat preventing the sugar carbon compounds in the coffee beans from developing. Also called Herbal; Grassy. GREEN COFFEE BEANS (Green Beans; Green Coffee) – See Green Coffee Beans. GREEN COFFEE BERRIES (Green Berries) – The green berries that appear on coffee trees after the small, fragrant white flowers appear. The green coffee berries gradually ripen over many months into coffee cherry (fruit). See Harvesting Coffee. GREEN COFFEE EXTRACT (GCE) – An extract produced as part of the Process method of decaffeinating coffee. Green coffee extract is produced by soaking green coffee beans (milled but not yet roasted) in hot water and allowing them to release their caffeine and coffee solids into the water. The coffee beans are then discarded and the liquid is passed through a carbon filter which traps the caffeine, yet allows coffee solids to pass through. The resulting extract, which is known as green coffee extract (GCE) and is comprised of decaffeinated coffee solids, is then used to decaffeinate a new batch of green coffee beans. Due to the composition of the green coffee extract, caffeine diffuses from these new green coffee beans. The GCE is then put through a proprietary carbon filter that removes the caffeine. This process is repeated until the coffee beans are comprised of only .1% caffeine, or one-tenth of one percent, which means that the coffee beans are 99.9% caffeine free. At this point the coffee beans are dried out and most of their flavor qualities are left intact. Also see Decaffeinated Coffee. 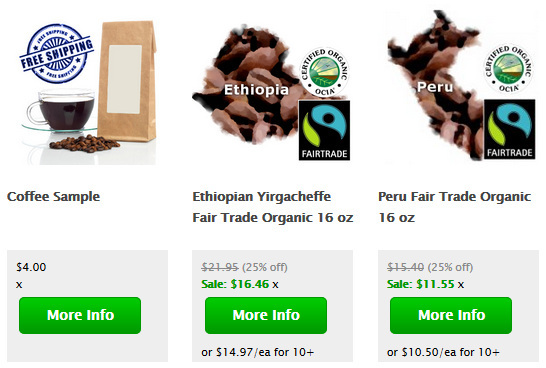 GREEN MOUNTAIN COFFEE ROASTERS – See Coffee Companies. GRINDING COFFEE – See Grinding Coffee. GRINDS BIN – The container that holds the roasted, ground coffee after grinding. GRIND SPECIFICATIONS – The grind specifications delineate the proper size of the coffee particles, from fine to coarse, for the specific brewing method and brewing equipment, with a goal of optimizing the extraction of the coffee’s flavor and aroma components. For coffee the proper grind varies for different brewing methods. See French Press Coffee; Automatic Drip Coffee Makers; Espresso Brewing; Coffee Brewing. GROUNDS – Roasted coffee beans that have been subjected to grinding, typically using a coffee grinder. 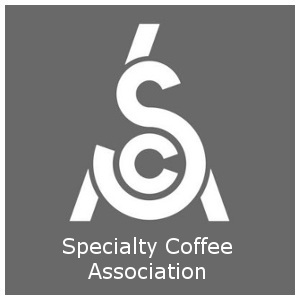 GROUNDS FOR HEALTH – See Coffee Associations, Organizations, and Boards. GROUNDY – A cellar-like or mushroomy, musty aroma/odor or taste reminiscent of soil/earth; a dirt-like sensation. The groundy quality in a coffee is largely attributed to the absorption of organic material from the ground into the fats of the coffee beans during the harvesting/drying process, but also may be attributed in part to the coffee plant’s botanical origins. Also called earthy, dirty. The groundy quality may be desirable or undesirable. A groundy and/or spicy quality is typical of premium gourmet coffees from Indonesia. GROUP – The part of an espresso machine (espresso coffee maker) which the portafilter clamps into. Typically the group, which is also called the brew head or delivery group, sticks out the front of the espresso machine. GROUPHEAD – The part of an espresso machine (espresso maker) which contains the portafilter locking connector and dispersion screen and also maintains a stable temperature for proper espresso brewing. Groupheads are typically constructed from brass though aluminum and stainless steel also may be used. GROUPO – The part of an espresso machine (espresso coffee maker) that holds the filter basket(s) which in turn hold(s) the roasted, ground coffee during the brewing of the espresso. The groupo, which is also called the portafilter or filter holder, contains one, or more likely two spouts out of which the espresso pours. The groupo also typically has a handle made out of wood, plastic, or another material that will not heat up easily when the espresso machine heats up. Most groupos look like a small cup on the end of a handle – this cup holds the ground coffee which is used to brew one or two espresso shots. Most groupos have two spouts so two espresso shots may be brewed simultaneously. The design of the groupo is such that it is very easy and relatively quick to attach (e.g., clamp) and detach (e.g., unclamp) the groupo from the group on the espresso machine. Groupos may be constructed from chrome-coated brass or copper (on more expensive models) or steel, aluminum, or other heat-tolerant materials. GUATEMALA ANTIGUA COFFEE (Guatemalan Antigua) – See Guatemala Antigua Coffee. GUATEMALA ATITLAN COFFEE (Guatemalan Atitlan Coffee) – Atitlan is a coffee growing region surrounding Lake Atitlan in Guatemala near the Pacific Ocean and near three volcanic mountains. This region receives plentiful rainfall all year around with no month receiving less than 50 mm of rain. Coffees from the Atitlan region are known for their rich flavor and full body with an aromatic, floral or spicy acidity that is crisp and pronounced. The coffee cherry (fruit) are harvested from December to March and most of the coffee plants are of the varietal Bourbon (Coffea arabica var. bourbon). Also grown are the coffee plant varietals Typica (Coffea arabica var. typica), Catuai (Coffea arabica var. catuai), and Caturra (Coffea arabica var. caturra). The coffee plants of the Atitlan region are grown at elevations from 4,000 feet to 5,900 feet where the humidity is around 75%, and where coffee diseases and pests provide very few problems. Most farm sizes in this region are about 12 hectares. Most of the coffee plants are fertilized with organic matter rather than with chemical fertilizers. Some use the waters of Lake Atitlan during the wet processing of the coffee and then the beans, which are then sun-dried. GUATEMALA COBAN COFFEE (Guatemalan Coban Coffee) – See Guatemala Coban Coffee. GUATEMALA COFFEE (Guatemalan Coffee) – See Guatemala Coffee. GUATEMALA COFFEE GRADING (Guatemalan Coffee Grading) – The Guatemalan coffee grading system defines the Strictly Hard Bean (SHB) grade to include coffee beans grown at elevations higher than 4,500 feet above sea level, while the Hard Bean (HB) grade includes coffee beans grown between 4,000 feet and 5,000 feet above sea level. As with other coffee growing areas, the assumption is that the higher elevation bean is harder (more dense), and thus of a higher quality, or grade. Also see Guatemala Coffee. GUATEMALA FRAIJANES PLATEAU (Guatemalan Fraijanes Plateau) – Coffee growing region in Guatemala in the mountainous region north of Lake Amatitlan. These mountains surround the Valley of Ermita which is the location of Guatemala City. Coffee is grown at elevations from 4,000 feet to 5,000 feet above sea level where the temperature averages about 72 degrees Fahrenheit (22 degrees Celsius) all year around with rainfall of about 1,500 mm each year and a relative humidity of about 60%. The mineral-laden soil, which is high in potassium, has benefitted from the recent ash deposits due to the volcanic activity of Volcan de Pacaya. The soil quality is said to produce a cup with an excellent body. The ideal soil and climate of the Fraijanes Plateau produce premium Strictly Hard Bean grade Guatemala Coffee, which is the highest-rated coffee bean in the Guatemala coffee grading system. Coffees grown on the Fraijanes Plateau are known for their full body, distinct acidity, and soft aroma. The quality of coffees grown in this region has been compared to Guatemala Antigua Coffee. Also see Guatemala Coffee. GUATEMALA HIGHLAND HUEHUETENANGO (Guatemalan Highland Huehuetenango) – Located in Guatemala near Mexico’s border, the Highland Huehuetenango coffee growing region sits at elevations between 5,000 feet and 6,000 feet above sea level in the Sierra de los Cuchumatanes – a 400-kilometer mountain range whose peaks rise to 3,828 meters above sea level. These mountains cross the southern region of Huehuetenango. Average annual rainfall in the Highland Huehuetenango region is about 1,800 mm with a humidity of about 75%. Average temperatures are around 73 degrees Fahrenheit (23 degrees Celsius). Coffee harvesting season is from January through April. Coffee plant varietals grown in the highland Huehuetenango region include Caturra (Coffea arabica var. caturra), Bourbon (Coffea arabica var. bourbon), and Catuai (Coffea arabica var. catuai). The dry and hot winds of Mexico’s Tehuantepec plain protect the Highland Huehuetenango coffee plants from frost. GUATEMALA HUEHUETENANGO COFFEE (Guatemalan Huehuetenango Coffee) – See Guatemala Huehuetenango Coffee. GUATEMALA NUEVO ORIENTE (Guatemalan Nuevo Oriente) – This coffee growing region in eastern Guatemala is located along the border with Honduras where an ideal climate along with clay and metamorphic volcanic soils produce quality coffee with a good body and distinct acidity. Nuevo Oriente coffee grows at elevations from 4,300 feet to 5,500 feet above sea level where the rainfall averages about 1,900 mm each year and temperatures range from 64 to 77 degrees Fahrenheit (18 to 25 degrees Celsius). The coffee cherry (fruit) are harvested from December into March. Coffee plant varietals grown in Nuevo Oriente include Catuai (Coffea arabica var. catuai), Bourbon (Coffea arabica var. bourbon), Caturra (Coffea arabica var. caturra), and Pache (Coffea arabica var. pache). Also see Guatemala Coffee. GUATEMALA ORIENTE (Guatemalan Oriente) – See Gutemala Nuevo Oriente. GUATEMALA RAINFOREST COBAN (Guatemalan Rainforest Coban) – Coffee growing region in Guatemala in the country’s north and predominantly characterized by humid, subtropical forests where rain falls all year around totaling about 3,250 mm annually, relative humidity of around 90%, and temperatures ranging from 59 to 73 degrees Fahrenheit (15 to 23 degrees Celsius), a fluctuation that is largely dependent on the north winds. Both Hard Bean and Strictly Hard Bean coffees are grown in this region at altitudes between 4,300 feet and 5,000 feet above sea level. The coffee cherry (fruit) are harvested from December to March. Coffees from Coban exhibit the typical Guatemalan coffee qualities which include an excellent body, usually full or medium, with a rich and spicy flavor and light fruity acidity, often floral, and a lively aroma with light winey notes. Coffee plant varietals grown in the Rainforest Coban region include Bourbon (Coffea arabica var. bourbon), Catuai (Coffea arabica var. catuai), and Caturra (Coffea arabica var. caturra). Also see Guatemala Coffee. GUATEMALA VOLCAN SAN MARCOS COFFEE (Guatemalan Volcan San Marcos Coffee) – The warmest and wettest coffee growing region in Guatemala, Volcan San Marcos is also the country’s first area to produce flowering coffee plants each year. Harvesting begins in December and continues into March. Coffee is grown at elevations between 4,000 feet and 6,000 feet above sea level where the average annual rainfall is about 4,500 mm and the average humidity is about 75%. The region’s climate is affected by the nearby Pacific Ocean. Coffee plant varietals grown in Volcan San Marcos include Bourbon (Coffea arabica var. bourbon), Catuai (Coffea arabica var. catuai), and Caturra (Coffea arabica var. caturra). Also see Guatemala Coffee. GUSTATION – The human tasting process which includes the tongue’s perception of the four primary tastes – sweet, sour, salty, and bitter – when materials containing these qualities are mixed with a person’s saliva.